Facilitating Effective Change: Helping Leaders Lead the Way, by Dr. Patrick Love and Patrick Putorti, is now available for purchase through leading book and e-commerce stores. Once a business moves from small to midsize or large, progress will begin to move backward if it has not identified a specific individual on the team dedicated to facilitate improvement. “Facilitating Effective Change: Helping the Leader Lead the Way” is available for purchase now at most major book and e-commerce stores. 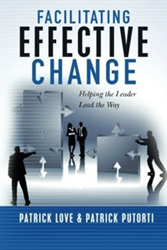 To order your own copy, visit http://www.amazon.com/Facilitating-Effective-Change-Helping-Leader/dp/1505402387.